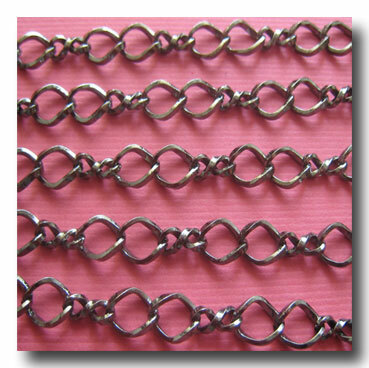 GUNMETAL TWISTED FIGURE EIGHT CHAIN. FINISH: Gunmetal. BASE: Brass base. STYLE: Twisted two link curb. WEIGHT: Medium. DIMENSIONS: 5mm links x 10mm long, connected by two small twisted links. Also AVAILABLE in: Silver Plate 1-132, Antique Brass 1-101, Antique Copper 1-089 and Bright Copper 1-091.